In fulfilling the first promise, President Obama has appointed Clifford Sloan, described by The Hill as “a veteran Washington attorney and civil servant.” He was “an associate counsel to former President Clinton and an assistant to the solicitor general in the first Bush administration,” and also “worked as associate counsel in the Office of Independent Counsel investigating the Iran-Contra affair and clerked for Supreme Court Justice John Paul Stevens.” More recently, he was the publisher of Slate magazine, and legal counsel for the Washington Post‘s online operations. President Obama still has a second envoy to appoint, at the Pentagon, but this is good news. However, it is no time for complacency. The President urgently needs to fulfill the two other promises — releasing cleared Yemenis and releasing other cleared prisoners. 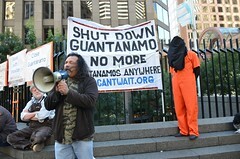 86 of the remaining 166 prisoners were cleared for release by the President’s inter-agency Guantánamo Review Task Force in January 2010, and 56 of those men are Yemenis. Although it is important that President Obama lifted the ban he himself imposed on releasing cleared Yemenis, following the failed airline bomb plot on Christmas Day 2009, which was hatched in Yemen, obstacles remain in Congress. The appointment of Cliff Sloan may augur well for engagement with the parties necessary for the release of prisoners, but much work still remains to be done. On Friday, the House of Representatives voted to renew the restrictions on the release of prisoners that have been present in the National Defense Authorization Acts over the last two years, cynically adding a specific ban on the release of prisoners to Yemen. The Yemen amendment, which prohibits using funds to transfer prisoners to Yemen, was put forward by Rep. Jackie Walorski (R-Ind. ), and was passed by 236 votes to 188. Fundamentally misunderstanding the problems of endlessly holding men who have never been charged, tried or convicted of crimes, Rep. Walorski said, “It makes no sense to send terrorists to a country that has an active terrorist network,” even though, of course, the cleared prisoners are not, and have never been terrorists. The Senate, where Democrats have a majority, will also debate its own version of the NDAA, and it is to be hoped that they will support the President’s plans, although whether enough pressure can be exerted to persuade lawmakers to drop all the restrictions remains to be seen. If not, the President will need to use a waiver in the NDAA that has existed since the restrictions were first imposed a year and a half ago, but which he has not yet used. Although these developments hint at progress, they are not, in and of themselves, sufficient to constitute the kind of significant activity that is necessary both to move definitively towards the closure of the prison, and, crucially, to reassure the prisoners still risking their lives on a prison-wide hunger strike that they have not been forgotten. On Monday, similar sentiments were expressed by Cori Crider, the strategic director at Reprieve, the London-based legal action charity whose lawyers (including Crider) represent 15 men still held at Guantánamo, including Shaker Aamer, the last British resident at the prison. In the heading for this article, I mentioned three promises that President Obama needs to fulfill. In addition to releasing the Yemenis, and releasing other cleared prisoners (including Shaker Aamer), he needs to address the 46 other prisoners he designated for indefinite detention without charge or trial in an executive order in March 2011. He did so on the basis that the Guantánamo Review Task Force had concluded that they were too dangerous to release, but that the evidence against them couldn’t be used in a trial. What this means is that the information used to make these decisions is largely worthless — extracted from prisoners who were tortured or otherwise coerced, or from others who were bribed with better living conditions, or preyed on because they were mentally unstable. John Bellinger, a former legal adviser to the State Department in the Bush administration, told the journalists that, in his opinion, President Obama “ducked the hardest question about Gitmo” in his national security speech — “what to do with those who pose a significant threat but cannot be prosecuted,” but that is not strictly true, as that is the purpose of the review process. What is necessary is for it to be genuinely objective, and for it to start from the presumption that, whatever advice President Obama was given back in 2010, it is unacceptable to hold 46 men for the rest of their lives without charge or trial, and 21 others, initially designated for trials by the task force, but who, as the military commissions’ chief prosecutor, Army Brig. Gen. Mark Martins, conceded last week, will never be tried. In the meantime, we will continue to monitor developments closely. We understand that the closure of the prison needs clear plans if lawmakers are ever to be persuaded to back proposals to bring it to an end. Some former officials who spoke to the Wall Street Journal’s reporters said they believe that the administration “will eventually back proposals to bring these detainees [the 80 not cleared for release] to an American maximum-security prison,” echoing John McCain’s comments at the weekend, which I mentioned above. Many advocates for the closure of Guantánamo find that disturbing, but at “Close Guantánamo” we have always believed that moving men to the US mainland will give them greater rights than they have at Guantánamo, and will enable new legal challenges to be made. For now, however, we hope that everyone concerned with closing the prison will keep pushing for the release of the 86 cleared prisoners, and will also keep pushing for the majority of the 80 others to be freed unless they are to be put on trial. Press TV has conducted an interview with Andy Worthington, with the Close Guantanamo Campaign, about the hunger strike still continuing at Guantanamo Bay prison. Press TV has conducted an interview with Franklin Lamb, international lawyer, about force feeding the inmates at Guantanamo Bay prison. This entry was posted in All Posts News Politics and-or Videos, Gitmo, Human Rights, Politics, Writers For Dandelion Salad and tagged Andy Worthington, Human Rights on Dandelion Salad, Hunger Strike, John Kerry, Lamb-Franklin, Meet the new boss the same as the old boss, NDAA, Worthington-Andy, Yemen on Dandelion Salad. Bookmark the permalink. ← Noam Chomsky and the Leveretts: Iran and American Foreign Policy: Where Did the U.S. Go Wrong?